You know that fellow I mentioned in previous blog posts? The boyfriend who graciously tasted all of my new recipes and said they were good even when they definitely could have used a couple more practice runs? The fiancé who braved a blizzard so that I could check off a “must visit” restaurant from my list on Valentine’s Day? Well, I was lucky enough to seal the deal with that hunk on September 10, 2016. Just when the thrill of our engagement started to settle in, mysterious and alluring packages from our wedding registry started to arrive on our doorstep. As a lady who has dreamt more of wielding that all-powerful registry gun than the color of the roses in the centerpieces, I squealed for joy in an embarrassing way when our first set of serving platters arrived. The Kitchen Aid mixer I’ve lusted after since the ripe old age of six; our dear Louisville friends banded together to make it a reality! The Vitamix blender that’s so powerful it vibrates everything on my kitchen counter when I crank it up to full speed; thanks Gramps and Grams! The Wusthof knives I cut myself with no less than three times the day I opened them; you’re too generous Aunt Louise and Uncle Val! And David was kind enough to feign excitement even as he struggled to close our kitchen cabinets due the generosity of the people we love most. It seems like every time I turn on Food Network one of my idols is doing serious work on a humongous wood cutting board. I’ve always admired these beasts for their handsome appearance, and I assumed I would absolutely need one to do all of my slicing and dicing if I was ever going to join the ranks of my heroes, Ina Garten and Geoffrey Zakarian. Thank goodness the wedding rolled around because now my tiny apartment kitchen boasts two. TWO heavy duty, totally boss cutting boards that make the most satisfying noise when you press a piece of honed steal into them. I immediately put my new cutting boards to the test; they were the first and last stops for every meal I prepared. Not only did they look fly, they also made me feel like a pro. Fast forward a couple of weeks and let’s just say I felt less like a pro when I realized they were starting to smell simultaneously of garlic and pineapple and needed a good cleaning. I did my thing the way I normally do. A little water to rinse away the debris, some baking soda to scrub and clean, and a healthy dose of lemon juice to deodorize. Works like a charm every time. The next part is where I ran into trouble. I knew that wood cutting boards and utensils need to be oiled to keep them moisturized and prevent them from cracking. I slathered on some organic canola oil and propped the cutting board up to dry overnight. Big mistake. Huuuuge. The next morning my cutting board was discolored and, if you can believe it, smelled worse than the pineapple-garlic potpourri that was infusing my kitchen previously. After a little research, I scrounged up a remedy and set my most hard-working kitchen accessory back right. If you’ve got a wood cutting board around, listen up! I don’t want you repeating my amateur mistakes. Learn how to care for your pieces simply and easily so you and your cutting boards are both well oiled, kitchen machines. 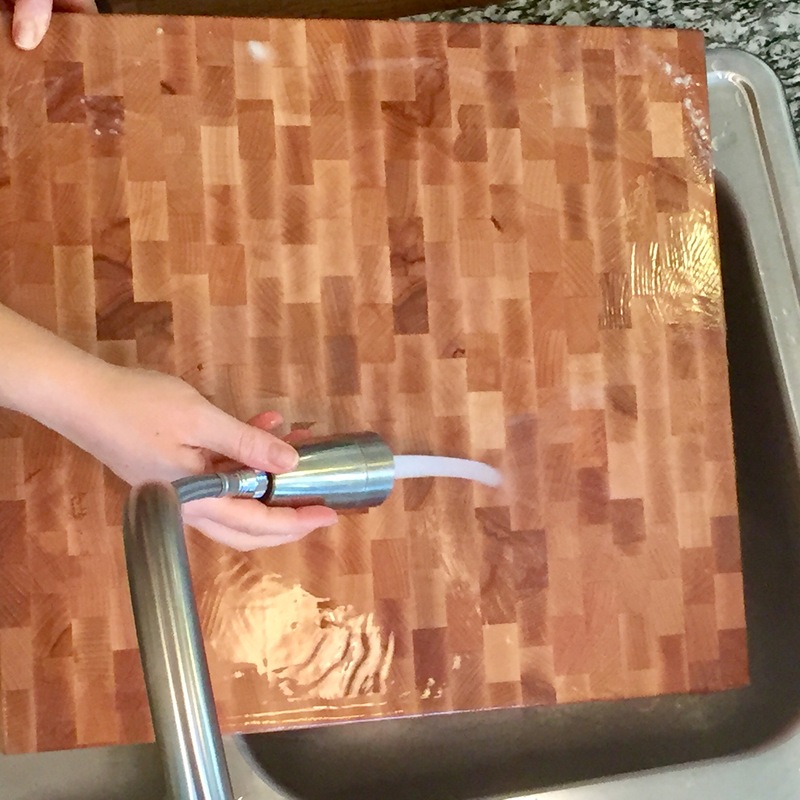 Rinse any food debris from your cutting board with warm water. Place your wood cutting board flat on a sturdy surface. I propped mine up over the sink. Sprinkle the surface liberally with baking soda. Squeeze a half of a lemon over the baking soda. 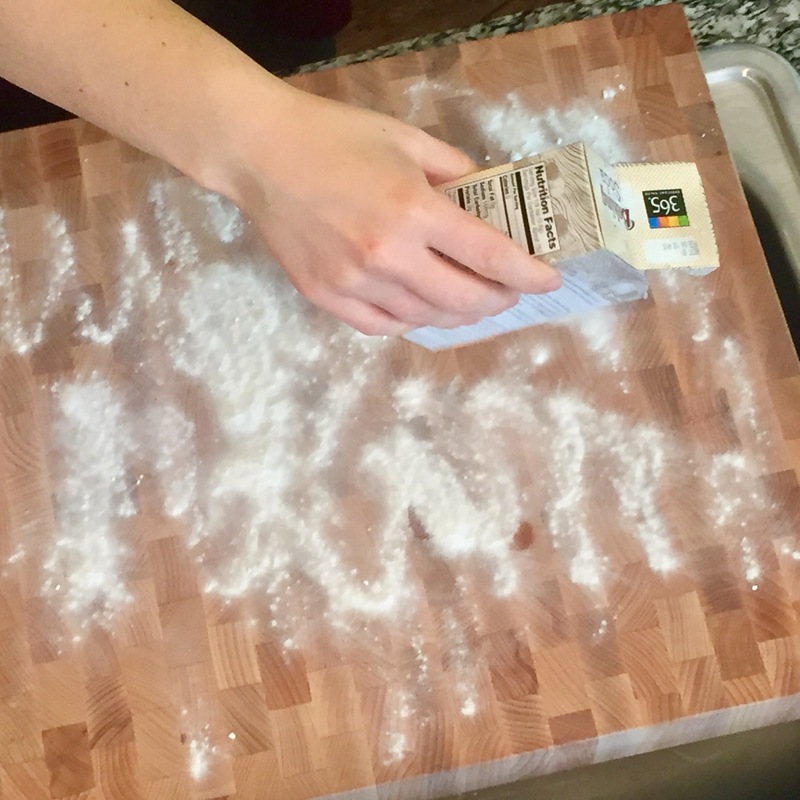 You’ll notice the mixtures starts to bubble up; that’s a good sign it’s getting clean and neutralizing the funky stuff left behind on your cutting board. 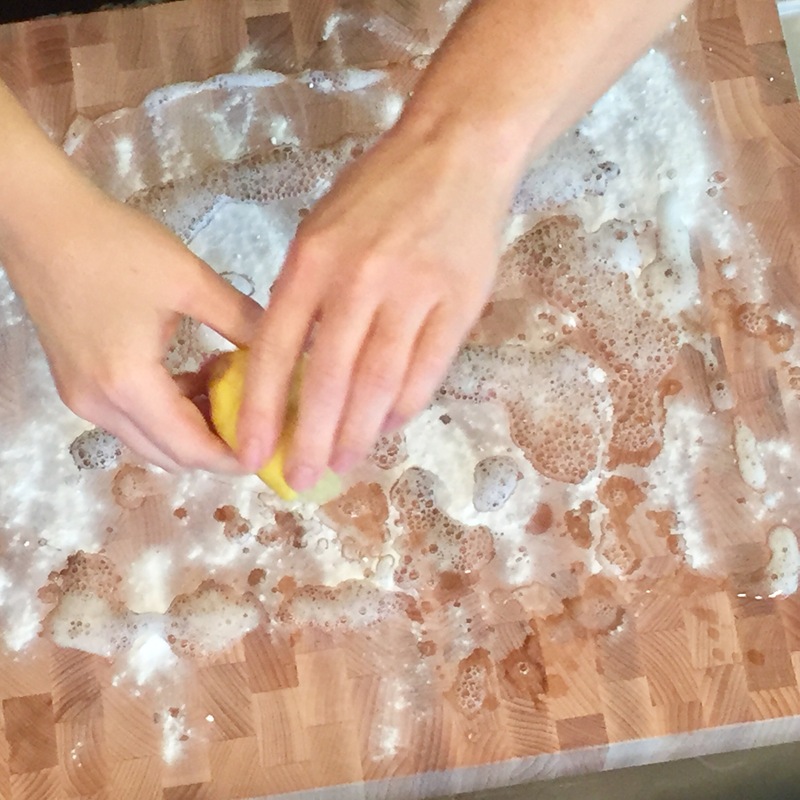 Use the cut side of the lemon to scrub the board in a circular motion. It’s gentle and imparts more of the lemon essence on your board. Don’t worry, the smell and taste of lemon doesn’t stick around and impart its flavor on your subsequent meals. 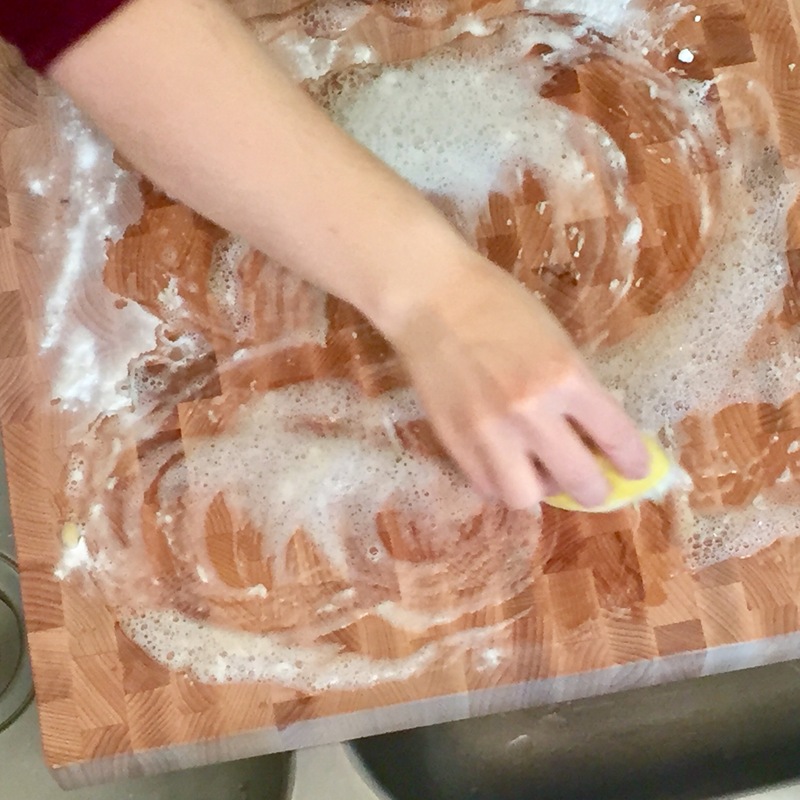 Rinse the board with warm tap water and wipe dry with a paper towel or dish towel. Let dry about an hour. Once the cutting board no longer feels moist to the touch, drizzle about a tablespoon of oil on the wood surface. Rub the oil into the board using a paper towel or a kitchen towel. Important note (as confessed above): the oil you use is IMPORTANT! I recommend going to a home goods supply store and picking up a bottle of oil specifically designated for wood cutting boards. It’s about five to ten bucks and lasts forever; plus, you’ll rest easy knowing you’ve got the right stuff for the job. If you don’t want to invest in cutting board oil and have some mineral or coconut oil lying around, feel free to use it. DO NOT USE OLIVE, CANOLA, OR VEGETABLE OILS as they spoil and will result in discoloration and odor in your board! Prop the cutting board up and allow it to dry overnight. Repeat this process monthly. 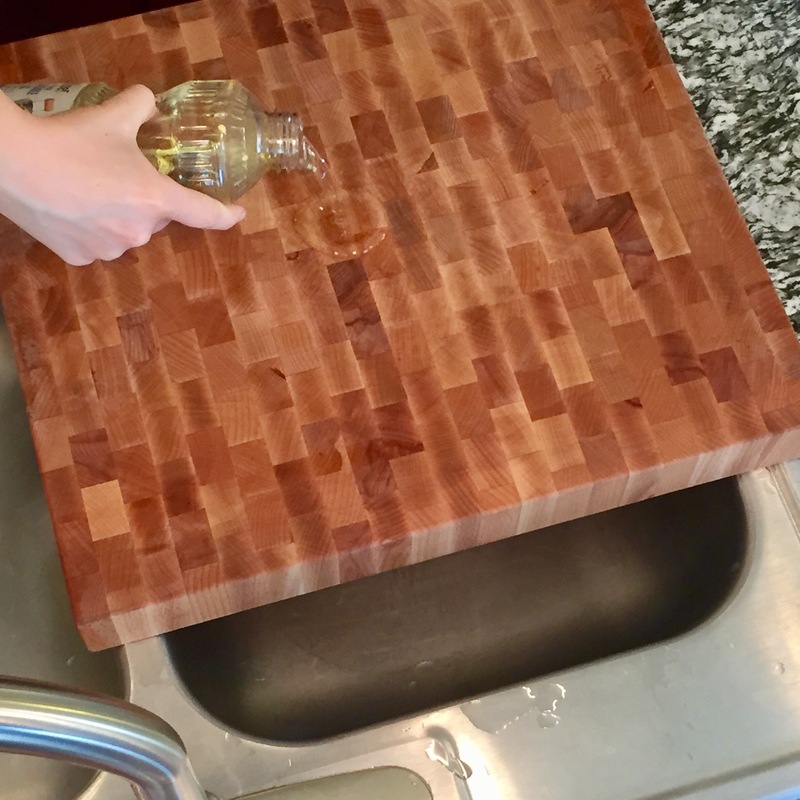 Use warm, soapy water to clean your cutting board in between oilings. *A note about plastic cutting boards: I use them all the time too. They require less maintenance in the short run, but don’t hold up nearly as long as a wood piece. I usually keep a large plastic cutting board around for meat and replace it quarterly, or when you start to notice deep cuts and/or discoloration on the surface. When you start to notice these signs, it’s a pretty good indicator you’re no longer getting them clean. Pitch ‘em and grab a new set; they’re relatively inexpensive. And remember, it’s always a good idea to use different boards for meat and fresh produce. I use my wood cutting boards for fruits and veggies, and my plastic ones for meat and other animal products. Keep them separate and you won’t have to worry about any pesky, meat critters sticking around and winding up in your fruit salad. Does it have to be lemon, or can it be any citrus? Yeah, absolutely. Lemons and limes are low in sugar and high in acidity, and both work well to naturally disinfect and remove odor and stains. I would steer clear of higher sugar citrus like orange or grapefruit. And because cleaning unfortunately goes hand-in-hand with cooking, here’s a great link to using lemon (and other natural products) for all of your cleaning needs: http://earth911.com/living-well-being/health/cleaning-vinegar-baking-soda-lemon/.